Methanol, a key building block for the complex organic compounds that comprise life, has been detected for the first time in the protoplanetary disk of a young, distant star. This finding could help scientists better understand the chemistry occurring during a planet's formation that could ultimately lead to the emergence of life. Scientists made the methanol discovery around TW Hydrae, a star about 80 percent of our sun's mass and roughly 5 million to 10 million years old. It represents a younger version of what our solar system may have looked like during its formation more than 4 billion years ago. At about 170 light-years away, TW Hydrae has the closest protoplanetary disk to Earth. This methanol gas likely came from methanol ice located slightly further away from the star. The scientists detailed their findings in the paper, "First detection of gas-phase methanol in a protoplanetary disk," published the journal Astrophysical Journal Letters. "Methanol is an important molecule because it has been shown in laboratory ice experiments to be a feedstock of larger and more complex molecules," said study lead author Catherine Walsh, an astrochemist at the University of Leeds in England. 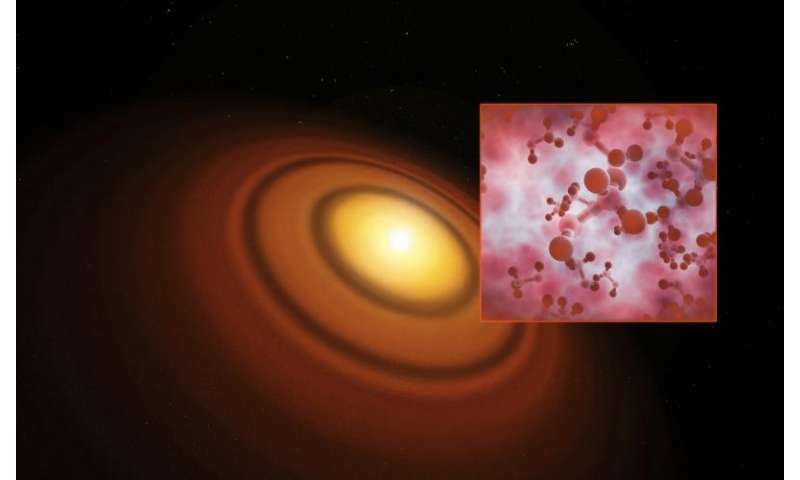 "The successful detection of methanol in a protoplanetary disk provides compelling evidence that larger molecules are also present." To analyze TW Hydrae, scientists used the Atacama Large Millimeter/Submillimeter Array (ALMA) in Chile, the most powerful observatory to date for analyzing the chemistry of nearby protoplanetary disks. ALMA can also map where cold dust and gas is located in these disks with unprecedented resolution. For example, it recently detected gaps in these disks potentially carved by nascent planets. Methanol in protoplanetary disks is thought to begin first as ice, forming through chemical reactions on the surfaces of dust grains. Methanol formation is a process that releases heat, and the dust grains help absorb this excess energy to stabilize newly-made methanol molecules, Walsh said. Dust grain surfaces can also catalyze methanol formation, reducing the amount of energy these molecules need to form. If methanol ice in a protoplanetary disk spirals closer to its star, the volatile molecule can get excited by solar radiation and become a gas. This gas is what researchers have now detected. The researchers suggest that dust grains up to a millimeter large that are laden with methanol ice reside within 50 AU from TW Hydrae. As dust grains grow bigger, they reach a size where they experience drag from surrounding gas. This drag slows the dust grains down, and they move inward toward the star, Walsh said. Once methanol ice gets closer to TW Hydrae, it becomes methanol gas, but the researchers do not think this happens because the ice is heating up, as previous research suggested. Instead, they suggest that other mechanisms are responsible, such as ultraviolet rays from the star. This finding may alter how scientists model protoplanetary disk evolution in the future. Methanol is one of the largest complex organic compounds detected in protoplanetary disks to date. Moreover, it is the first protoplanetary disk organic molecule with an unambiguous origin as ice. As Walsh noted, methanol can serve as the building block of larger organic molecules. Measuring levels of methanol could, in principle, shed light on the amounts of other organic compounds that may exist within the icy, comet-forming material orbiting stars, Walsh said. These complex organic molecules may have helped life emerge on Earth. "It has been suggested that comets contributed some, if not all, of the organic feedstock to the young Earth needed to initiate or drive life," Walsh said. "The presence of organic-rich comets in other disks suggests that the basic ingredients for initiating or driving life are also presence in these disks." There are a number of mysteries that remain unsolved in these new findings. 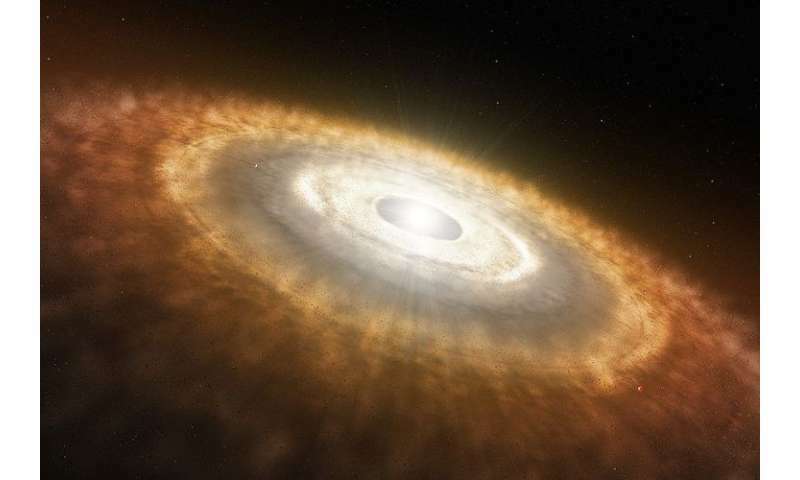 For instance, the observed methanol gas levels are, unexpectedly, as little as 100 times less than previously expected from recent models of protoplanetary disk chemistry. One possibility is that the models overestimate the rate at which methanol ice releases methanol gas, Walsh said. Another possibility is that these models underestimate how much stellar radiation and other factors destroy methanol molecules, she said. The methanol gas "is also in a different region of the disk than predicted in earlier models, which remains a puzzle," Walsh said. "We are working hard trying to understand this puzzle, and new data from ALMA, which will be in hand in 2017, will help us to do this." Future research will also hunt for methanol in other nearby protoplanetary disks, and for larger organic molecules in all these disks, Walsh said. Interesting. Methane is a hydrocarbon that comes from decomposing dinosaurs. I wonder how the dinosaurs got to the star? Since this is not methane but methanol, which is methyl alcohol, the linking of dinosaurs is irrelevant and inane. There are also several different non-biological processes that form methane as well, so while it CAN be a possible sign of life, it is not a silver bullet link to life anyway.